I still relish the good old days when my father forced the whole family to watch Al Jazeera news every morning before we left for school. Most of the things that the anchors read did not make sense to me or my other siblings but perhaps, it did to my father. While watching, all I admired was the beautiful studio and how eloquent the anchors were, while wondering how journalists still had the courage to get video footages in war-torn enclaves of the world. This was during the Libyan Turmoil and not a day passed without something about Libya or the Arab spring. On the local scene, we watched only TV3. We became lovers and admirers of Emma Morrison and Gideon Aryeequaye until later when Israel Laryea, Roland Walker and Nana Aba Anamoah came along. So I grew up loving the media by default. Then in the heat up to the 2012 elections, while in Senior High School, I relied a lot on radios in the public buses I boarded to campus for information on the elections. I heard about the infamous “all die be die” comment on the radio. The arrest of Kennedy Agyapong and the death of President John Evans Atta Mills were all information I heard on the radio. With time, my love for television dwindled as I discovered my new love for radio. Among other things, my love for radio was spurred on by the fact that I could get access to it almost everywhere, once I had a phone that could connect. At some point, I became a lover of Asempa FM. I would listen to the Ultimate Sports Show hosted by PJ Mozey before Benedict Kwadwo Mensa Moshosho took over. I loved the sports team. The eloquence of Eric Asiedu Boadi, the “no-nonsense character” of Professor EK Wallace and the vigor of Mavis Amanor left me in absolute awe. Their usual panelists were very controversial and sometimes took entrenched positions that made the program occasionally too predictable. The controversial Isaac Opele Boateng, the Phobia love in Abdul-Aziz Haruna Futa, the wonderful and calm analysis of Jerome Boateng all made me love the show more. When they were done, I would keep my dial there to listen to the inspirational and motivational show of Maame Akua before enjoying Songo’s “Fire for Fire” and finally spending the rest of the day listening to the late Kwadwo Asare Baffour Acheampong’s (KABA) current affairs talk show. I was just a lover of Asempa FM and nothing else. After a while, I felt Kwadwo Mensah Moshosho was struggling to maintain the bar set by PJ Mozey. He was quite not my style of a host. He was argumentative, and sometimes too boring so I decided to change from the ultimate breakfast show and listen to any other morning show. The transition didn’t come easy as I had to make what would become the toughest decision of my life at the time. Finally, I managed to gather enough courage to tune off to listen to Citi FM’s Bernard Avle. There was a lot of fuss about him so I thought I should give his show a try. I was not disappointed at all. Bernard seemed to know a bit of everything while members of the morning show team showed strong prowess in their chosen fields. Richard Dela Sky was a fine legal brain, Kojo Akoto Boateng was a research based person but I did not particularly like the style Nana Ama Agyemang Asante brought to the show. I felt she was too sensational and sometimes veered off the topic under discussion. I didn’t matter to me as I felt the other guys on the team could make up for her deficit. Occasionally, I will tune in to Star FM, to listen to Nii Ardey Clegg. I love how he made legal issues understandable to the layman. I had a proper appreciation of the infamous Woyome issue on his show. Having had this journey with the media, I knew I would one day join the industry to learn more. I first joined the Ghana Institute of Journalism in 2017 before interning with Class FM all in a bid to fulfill this dream of working in or with the media. Reporting for Class FM, and going on assignments even as a novice, has and is really broadening my horizon. Sorry I had to bore you a bit with some history. It is necessary and will aid in establishing proper grounds for the point I seek to make. 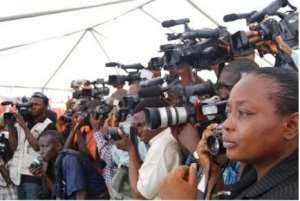 All my life, like many other Ghanaians, my major concern has been about how the media churns out news. I have focused on the voice and beauty of the anchor but never wondered how ownership affects the media. Hope we remember how we all focused on the beautiful game of football and forgot about the politics of it, only to wake up one day to discover the game had been infested with widespread corruption. While we enjoyed football, we forgot about the people who call the shots in football and how their governance was affecting the game. The result; a damming scandal called for the dismissal of Michel Platinni, the UEFA boss. When the governance structure of FIFA was put on the lenses, Joseph Sepp Blatter faced a lot of issues before finally resigning. The Ghana Football Association, the football governing body in the country, came to a standstill when Investigative Journalist, Anas Aremayaw Anas, dropped his Number 12 documentary that unveiled massive corruption in the game. So clearly, as much as the football game was important, the governance system was what determined how the game should be played and in who’s favour the game should go. Similarly, in the media industry, aside the beautiful story angles, the amazing studios and the beautiful voices that accompany the story, the ownership structure can also jeopardize the media establishment. The proverbial saying, “he who pays the piper calls the tune” has and continues to be right in any sense. Producing news or running a media house is not charity work; it is very expensive. News production demands a strong financial backing, else one might not stand the test of time. So beyond the theories of gatekeeping and agenda setting of the media, finance remains a major determinant. Last semester in my “Introduction to Journalism” class, I raised these concerns to my lecturer, Mr. Desmond Lamptey, that even though the academics and theories of media are explicit and clear, one of the greatest threat to its existence was its ownership. During periods were we had only state-owned media, the media house barely reported the ills of the ruling class. The media always focused on painting the government of the day white and focused on projecting the policies and programmes of the government. People who were deemed to be critics of government were hardly given a hearing on such media platforms. The liberalization of the airwaves sent a good signal across but again the issue of ownership has become a major block in reporting factual and accurate news. There are media houses that are set up, owned and managed by political actors who seek to gain political capital. Such media houses have no regard for the basic ethics of the profession and recruit people who are only willing to do their bidding. Take a listen to the news stories and angles of Oman FM and Radio Gold and you can clearly tell that the angle of the stories are aimed at satisfying the pay master (you can agree to disagree). Programs of these media houses are designed in such a way that they serve the pay masters. In essence, because those who finance the media houses have a political interest to satisfy, basic journalistic ethics are not adhered to. Those who dare stay true to the ethics of journalism would have to go through the pain of seeking funding elsewhere. I remember Mr. Samuel Mensah (CEO of Omni Media, owners of Accra based Citi FM) stating in one of our classes how his media house lost advertising slot from RLG Ghana simply because the morning show team had analyzed RLG’s City of Hope project and realized the project would be difficult to implement. Such objective analysis cost them money that would have been used to run the company. Today, we all know they were right after all. The City of Hope Project never saw the light of day. The issue of ownership is not a local issue. Follow FOX TV and you will realize how they never see anything wrong with what Donald Trump does. Their news reports about him are one that seeks to glorify him. Then tune in to CNN and you will also realize they see nothing right with Donald Trump. They always take him to the cleaners. Carefully take a look at how international media houses are quick to tag a Muslim, terrorist, when they commit acts of terror but are reluctant to do same for people who commit acts of terrorism but are not Muslims. We cannot deny the fact that, even though media has standards that it adheres to, it is clear that whoever funds a media house, can influence the story lines and angle of the media house. We must start to have an open and genuine discussion on this issue. We must not turn a blind eye to facts that stare us in the face. The individuals we are allowing to own and fund media houses are a threat to the existence of the institution of Media. The constitution abhors censorship in totality so it will be wrong to try to censor it. Censoring of the media defeats the very purpose of the establishment of the media. The constitution again allows for private individuals to set up media organizations. In a country like Rwanda that we all glorify, Media freedom is curtailed but the country is doing well. Under Dr. Kwame Nkrumah, media freedom was curtailed even though the development agenda was kept alive. All great nations at some points have curtailed media freedom. It is also fair to state that some countries have curtailed media freedom and have not developed. They still wallow in the misery of underdevelopment. We are caught in between allowing the media the full space to operate but fear that such freedom has led to a lot of ill-motivated financiers to set up media houses for rather wrong purposes. We are also confused on whether to curtail media freedom which will result in societal problem. Can we have a candid discussion about the media and the way forward? Can we agree that theories might not necessarily be applicable in real life? Can we admit that people with enough funds have hijacked the media spaces and misinforming the public? Can we admit that the media is a powerful tool and we must do everything to protect it?